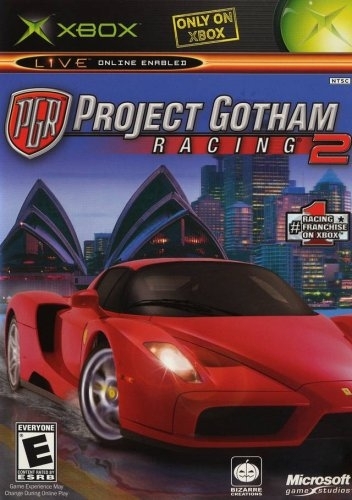 Following on from my other post about Blur, after the closure of Bizarre Creations I wanted to eulogise what is probably my favourite racing game ever – Project Gotham Racing 2. Judging by a lot of the reaction online to the demise of Bizarre, PGR2 was commonly cited as the best of the 4 game Project Gotham series and Metacritic scores agree with that. Comparing between franchises is obviously a much more subjective thing and in racing it often comes down your personal preference between realistic ‘simulations’ and knockabout ‘arcade’ fun. With licensed cars and real world cities, all meticulously modelled, the simulation approach would be expected for PGR and indeed there is a lot of nuance built into the game’s handling model. The tracks, at times tight and twisty streets, often demand judicious use of the brakes and for some having to pull the left trigger even once is far too ‘sim’ orientated for them. But since the game is focused on how you drive as well as how fast, it not only allows but positively encourages you to drive in the most fun way you can, even if the wheel-spinning tire-screeching slides of Project Gotham aren’t necessarily realistic. What sets the game apart is its finely judged balancing act along the simulation/arcade spectrum. There is depth without the daunting array of options of Gran Turismo and Forza, where endless mechanical tweaking in menus can be used to over come ability gained and learned in the driver’s seat. Pick your car from the small selection per event (certainly to begin with) and go. PGR2 still loves its cars every bit as much as those more feted simulation franchises. This is the game that introduced a showroom mode, letting you wander among your collection of gleaming expensive machinery. From here you can test drive any car you happen to be looking at. The game might not get bogged down in the minutiae of having every possible iteration of every model of every car, but it does want you to feel a sense of ownership and it does want the cars to feel real. In any car, in any event, even a test drive, there’s a small odometer clearly visible beneath the speedo, totting up every single mile you drive and have ever driven in each car. In your favourites, those quickly add up.